Stay tuned for more events to come…! In our booth you will experience how science can be transformed into technologies with positive social impact. We will show the concept of modifying perception via interactive cognitive tasks and real-time experiments from LUMINOUS. You will play in demo/games with multi-site brain stimulation, and its relation to consciousness. 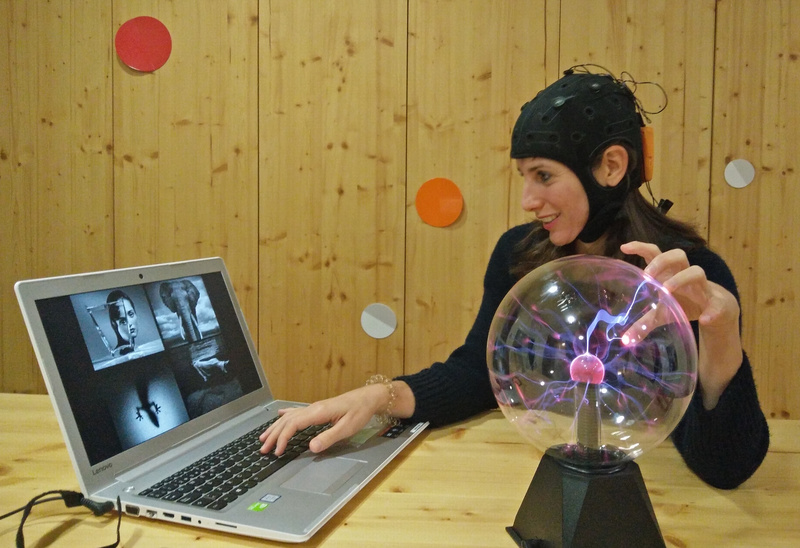 Dr. Eleni Kroupi, performing a demonstration with our multi-site brain technology. The networking session aims to provoke a cross disciplinary discussion on consciousness. Specifically, it targets to tackle the fundamental question on whether and how artificial intelligence and machine consciousness share some commonalities with human consciousness. Briefly, our vision in LUMINOUS is that consciousness will someday be electromagnetically measured and altered, and that the associated needed insights will prove crucial to the development of cognitive sciences. Inspired by recent developments in neuroscience and the potential role of fundamental concepts we study, model, quantify, and alter observable aspects of consciousness in humans. A moment of “AI meets Human Consciousness – Is there Machine Consciousness?”. Discussion between (from left to right), Prof. Antonio Chella (University of Bath), Prof. Joanna Bryson (University of Palermo) and our coordinator, Dr. Aureli Soria-Frisch (Starlab). Given the relationship of these goals with the broad concepts of information and complexity we expect the achievement of these goals to affect the understanding of consciousness within other disciplines. Indeed there are plenty definitions on consciousness, which closely depend on the generating discipline. 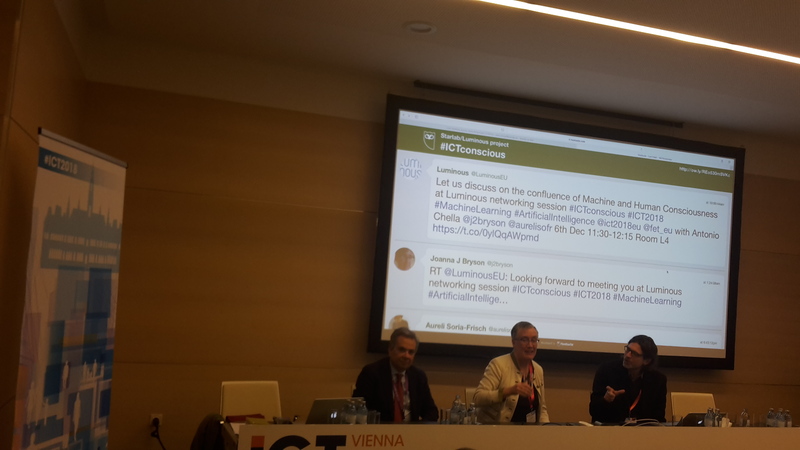 This networking session will bring those differences together, aiming to create a transdisciplinary consensus document on consciousness, the “Vienna Declaration on Artificial and Human Consciousness”. What is consciousness after all? This question has been one of the greatest mysteries of the universe, puzzling psychologists, philosophers, neuroscientists, physicists, medical doctors, monks, and artists over centuries. 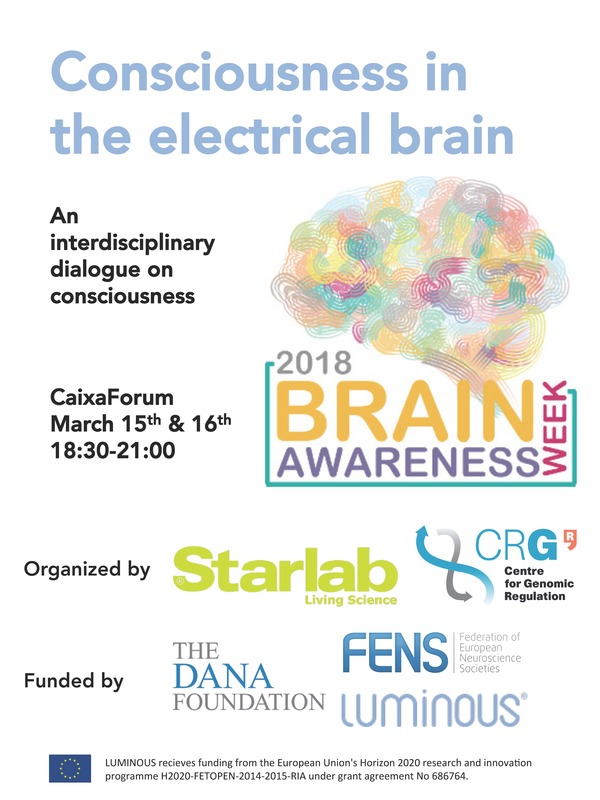 In the context of the Brain Awareness Week (BAW) 2018, the Centre for Genomic Regulation and Starlab have organized a variety of activities for the general public to reflect and explore the fascinating and still puzzling concept of consciousness. Understanding consciousness is one of the last frontiers in science and we would like to advance towards this aim sharing our passion with you. Blitz-talk: The Ghost in the Brain. What is consciousness? How does the brain reflect our inner experience? Luminous Lectures: “Luminous”: Measuring and altering consciousness in the electrical brain. Unravelling the black box of consciousness in healthy and diseased brains. Can we measure consciousness? Can it be altered through electromagnetic brain stimulation? Luminous, a European research project coordinated by Starlab, focuses on these questions by studying, modelling, quantifying, and altering observable aspects of consciousness. Fishbowl conversations: Join the debate with specialists from a variety of disciplines on consciousness related topics. Consciousness Wall: Help us create a collective view of consciousness through your paintings and writings about consciousness. Dive into the world of movies and documentaries on consciousness. Your brain tricks you! Try consciousness experiments by using electroencephalography signals and binaural bits, as well as conscious vs. subliminal perception. Campfire sessions: Share your experiences or point of view about different consciousness related topics in small groups.